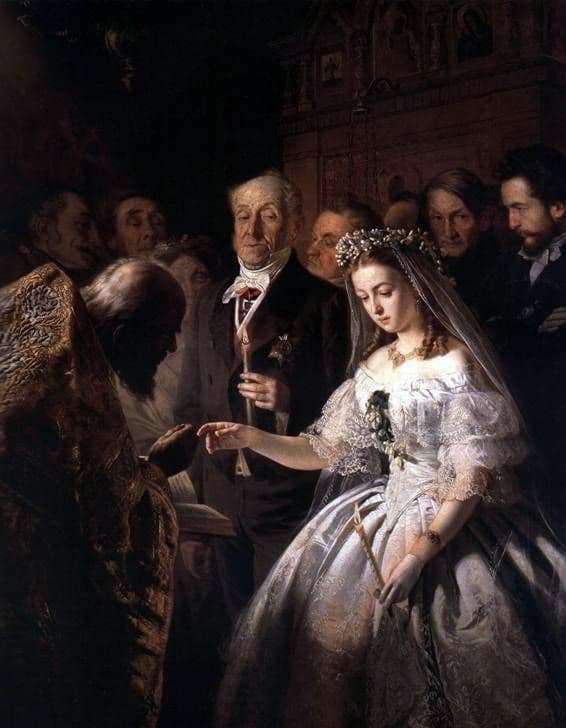 After the appearance of the painting “The Unequal Marriage” at the academic exhibition (1862), the whole of Russia spoke about the artist Pukirev. This successful work attracted public attention and sparked a passionate controversy in the press. On unequal marriages there are different opinions. However, history says that such marriages in the past brought suffering to young girls who were forcibly married to old men. This was a real tragedy for the victim, so this theme is often present in folk songs, literary works and art. Pukirev himself came from a family of peasants, he knew a lot about the life of ordinary people firsthand, he was worried about the problems of society. The painting “Unequal Marriage”, which became the peak of the master’s creative activity, is a vivid example. The subsoil of the picture is a real event about the unfortunate love of S. M. Varentsov, a prosperous manufacturer, Pukirev’s friend. Who got engaged to a poor young girl S. N. Rybnikova. However, the creative imagination of the artist was not limited to genuine facts. Pukirev deliberately portrayed the groom older, and the bride almost children. Besides, the bridegroom of Pukirev is not a manufacturer, but a dry and prim retired general. The author paints it with an unpleasant appearance: deep wrinkles on the face, loose skin, tightly clamped collar – everything suggests that the official is a callous person. He does not care about the tears of the bride. Without turning his head to her, the groom only in a whisper expresses his displeasure. The young bride is the complete contrast of the “newlywed”. She has a pretty oval face, small lips, light brown hair cast with a silky sheen. In a wedding dress with lace, transparent veil, she looks especially anxious and charming. VV Pukirev devoted his unique work of painting to the fate of the “no-doner”. His painting “Unequal Marriage” due to its relevance was well received by the public.